Here’s another in our series, Library Hacks, where we take a look at cool and interesting online resources from the Smithsonian Libraries and the cyberworld at large. Readers of this blog have probably figured out that the Smithsonian is more than a set of museums – it’s also a hub for research. 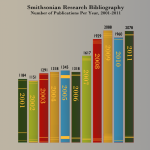 In 2011 alone, Smithsonian researchers published more than 2000 articles, books, and book chapters. Given the Institution’s 165 year history, the cumulative knowledge output of the Smithsonian Institution located in one place is quite the extensive resource. We at the Libraries keep track of all this research. A few years ago we launched Smithsonian Research Online (SRO) as a way to offer public access to this resource. 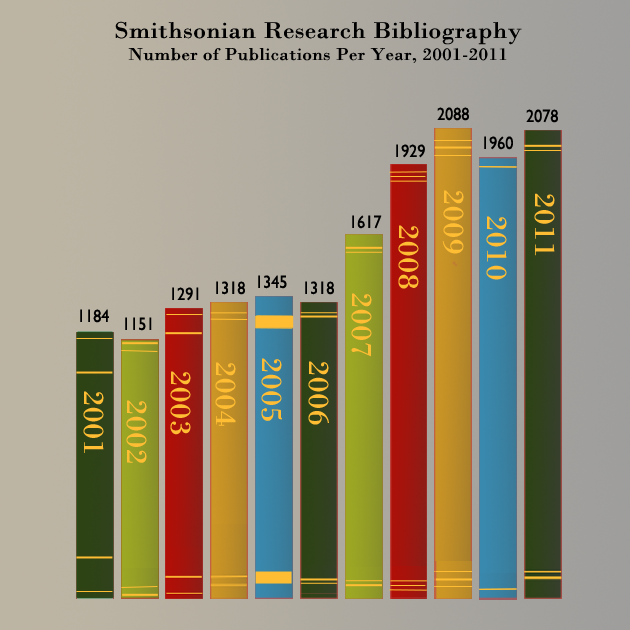 SRO is made up of two main components: the Smithsonian Research Bibliography and the Smithsonian Digital Repository. The first collects citations of all research output, while the latter is where we keep a copy of the published works in digital format for long-term preservation and access. Research Online provides a straightforward way to access the data and articles in both the Research Bibliography and the Digital Repository. This landing page allows you to search the Research Bibliography, with ability to search for a specific term, or limit by author, year, journal, or a specific museum/department at the Smithsonian. The Research Bibliography is ever evolving as we add newly published works along with historical literature. You can gain great insights into the work that goes on at the Smithsonian, simply by choosing a department and seeing what kind of research gets published. The Smithsonian Digital Repository, http://si-pddr.si.edu/dspace/ has a slightly different structure, with not just departments but also communities & collections, some of which fall outside or between established departments. Though not all the content is directly accessible by the public, visiting it will take you directly to the content provided by Smithsonian’s research community. In the coming months, I hope to explore Research Online and the world of Smithsonian research through data visualization. For now, the chart above is an overview of how many articles, books and chapters we have for each year since 2001. And keep in mind that since collecting did not start in earnest until six years ago, we do have some catching up to do.